Publication: Edwards, Amelia B. A Thousand Miles Up The Nile. London: George Routledge and Sons, Limited, 1891. pp. 409-465. WE had so long been the sport of destiny, that we hardly knew what to make of our good fortune when two days of sweet south wind carried us from Edfu to Luxor. We came back to find the old mooring-place alive with dahabeeyahs, and gay with English and American colours. These two flags well-nigh divide the river. In every twenty-five boats, one may fairly calculate upon an average of twelve English, nine American, two German, one Belgian, and one French. Of all these, our American cousins, ever helpful, ever cordial, are pleasantest to meet. Their flag stands to me for a host of brave and generous and kindly associations. It brings back memories of many lands and many faces. It calls up echoes of friendly voices, some far distant ; some, alas! silent. Wherefore – be it on the Nile, or the Thames, or the high seas, or among Syrian camping-grounds, or drooping listlessly from the balconies of gloomy diplomatic haunts in continental cities – my heart warms to the stars and stripes whenever I see them. Our arrival brought all the dealers of Luxor to the surface. They waylaid and followed us wherever we went ; while some of the better sort – grave men in long black robes and ample turbans – installed themselves on our lower deck, and lived there for a fortnight. Go upstairs when one would, whether before breakfast in the morning, or after dinner in the evening, there we always found them, patient, imperturbable, ready to rise up, and salaam, and produce from some hidden pocket a purseful of scarabs or a bundle of funerary statuettes. Some of these gentlemen were Arabs, some Copts – all polite, plausible, and mendacious. Where Copt and Arab drive the same doubtful trade, it is not easy to define the shades of difference in their dealings. As workmen, the Copts are perhaps the more artistic. As salesmen, the Arabs are perhaps the less dishonest. Both sell more forgeries than genuine antiquities. Be the demand what it may, they are prepared to meet it. Thothmes is not too heavy, nor Cleopatra too light, for them. Their carvings in old sycamore wood, their porcelain statuettes, their hieroglyphed limestone tablets, are executed with a skill that almost defies detection. As for genuine scarabs of the highest antiquity, they are turned out by the gross every season. Engraved, glazed, and administered to the turkeys in the form of boluses, they acquire by the simple process of digestion a degree of venerableness that is really charming. Side by side with the work of production goes on the work of excavation. The professed diggers colonise the western bank. They live rent-free among the tombs ; drive donkeys or work shâdûfs by day, and spend their nights searching for treasure. Some hundreds of families live in this grim way, spoiling the dead-and-gone Egyptians for a livelihood. Forgers, diggers, and dealers play, meanwhile, into one another's hands, and drive a roaring trade. Your dahabeeyah, as I have just shown, is beset from the moment you moor till the moment you pole off again from shore. The boy who drives your donkey, the guide who pilots you among the tombs, the half-naked Fellâh who flings down his hoe as you pass, and runs beside you for a mile across the plain, have one and all an "anteekah" to dispose of. The turbaned official who comes, attended by his secretary and pipe-bearer, to pay you a visit of ceremony, warns you against imposition, and hints at genuine treasures to which he alone possesses the key. The gentlemanly native who sits next to you at dinner has a wonderful scarab in his pocket. In short, every man, woman, and child about the place is bent on selling a bargain ; and the bargain, in ninety-nine cases out of a hundred, is valuable in so far as it represents the industry of Luxor – but no farther. A good thing, of course, is to be had occasionally ; but the good thing never comes to the surface as long as a market can be found for the bad one. It is only when the dealer finds he has to do with an experienced customer, that he produces the best he has. Flourishing as it is, the trade of Luxor labors, however, under some uncomfortable restrictions. Private excavation being prohibited, the digger lives in dread of being found out by the Governor. The forger, who has nothing to fear from the Governor, lives in dread of being found out by the tourist. As for the dealer, whether he sells an antique or an imitation, he is equally liable to punishment. In the one case he commits an offence against the state ; and in the other, he obtains money under false pretences. Meanwhile, the Governor deals out such even-handed justice as he can, and does his best to enforce the law on both sides of the river. By a curious accident, L. and the Writer once actually penetrated into a forger's workshop. Not knowing that it had been abolished, we went to a certain house in which a certain Consulate had once upon a time been located, and there knocked for admission. An old deaf Fellâha opened the door, and after some hesitation showed us into a large unfurnished room with three windows. In each window there stood a workman's bench strewn with scarabs, amulets, and funerary statuettes in every stage of progress. We examined these specimens with no little curiosity. Some were of wood ; some were of limestone ; some were partly coloured. The colours and brushes were there ; to say nothing of files, gravers, and little pointed tools like gimlets. A magnifying glass of the kind used by engravers lay in one of the window-recesses. We also observed a small grindstone screwed to one of the benches and worked by a treadle ; while a massive fragment of mummy-case in a corner behind the door showed whence came the old sycamore wood for the wooden specimens. That three skilled workmen furnished with European tools had been busy in this room shortly before we were shown into it, was perfectly clear. We concluded that they had just gone away to breakfast. Meanwhile we waited, expecting to be ushered into the presence of the Consul. In about ten minutes, however, breathless with hurrying, arrived a well-dressed Arab whom we had never seen before. Distracted between his Oriental politeness and his desire to get rid of us, he bowed us out precipitately, explaining that the house had changed owners and that the Power in question had ceased to be represented at Luxor. We heard him rating the old woman savagely, as soon as the door had closed behind us. I met that well-dressed Arab a day or two after, near the Governor's house ; and he immediately vanished round the nearest corner. 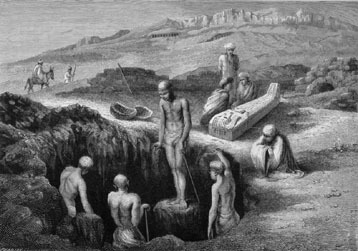 The Boulak authorities keep a small gang of trained excavators always at work in the Necropolis of Thebes. These men are superintended by the Governor, and every mummy-case discovered is forwarded to Boulak unopened. Thanks to the courtesy of the Governor, we had the good fortune to be present one morning at the opening of a tomb. He sent to summon us, just as we were going to breakfast. With what alacrity we manned the falucca, and how we ate our bread and butter half in the boat and half on donkey-back, may easily be imagined. How well I remember that early morning ride across the western plain of Thebes – the young barley rippling for miles in the sun ; the little water-channel running beside the path ; the white butterflies circling in couples ; the wayside grave with its tiny dome and prayer-mat, its well and broken kulleh, inviting the passer-by to drink and pray ; the wild vine that trailed along the wall ; the vivid violet of the vetches that blossomed unbidden in the barley. We had the mounds and pylons of Medinet Habu to the left – the ruins of the Ramesseum to the right – the Colossi of the Plain and the rosy western mountains before us all the way. How the great statues glistened in the morning light! How they towered up against the soft blue sky! Battered and featureless, they sat in the old patient attitude, looking as if they mourned the vanished springs. We found the new tomb a few hundred yards in the rear of the Ramesseum. The diggers were in the pit ; the Governor and a few Arabs were looking on. The vault was lined with brickwork above, and cut square in the living rock below. We were just in time ; for already, through the sand and rubble with which the grave had been filled in, there appeared an outline of something buried. The men, throwing spades and picks aside, now began scraping up the dust with their hands, and a mummy-case came gradually to light. It was shaped to represent a body lying at length with the hands crossed upon the breast. Both hands and face were carved in high relief. The ground-colour of the sarcophagus was white ; 1 the surface covered with hieroglyphed legends and somewhat coarsely painted figures of the four lesser Gods of the Dead. The face, like the hands, was coloured a brownish yellow and highly varnished. But for a little dimness of the gaudy hues, and a little flaking off of the surface here and there, the thing was as perfect as when it was placed in the ground. A small wooden box roughly put together lay at the feet of the mummy. This was taken out first, and handed to the Governor, who put it aside without opening it. The mummy-case was then raised upright, hoisted to the brink of the pit, and laid upon the ground. It gave one a kind of shock to see it first of all lying just as it had been left by the mourners ; then hauled out by rude hands, to be searched, unrolled, perhaps broken up as unworthy to occupy a corner in the Boulak collection. Once they are lodged and catalogued in a museum, one comes to look upon these things as "specimens," and forgets that they once were living beings like ourselves. But this poor mummy looked startlingly human and pathetic lying at the bottom of its grave in the morning sunlight. After the sarcophagus had been lifted out, a small blue porcelain cup, a ball of the same material, and another little object shaped like a cherry, were found in the débris. The last was hollow, and contained something that rattled when shaken. The mummy, the wooden box, and these porcelain toys, were then removed to a stable close by ; and the excavators, having laid bare what looked like the mouth of a bricked-up tunnel in the side of the tomb, fell to work again immediately. A second vault – perhaps a chain of vaults – it was thought would now be discovered. We went away, meanwhile, for a few hours, and saw some of the famous painted tombs in that part of the mountainside just above, which goes by the name of Sheykh Abd-el-Koorneh. It was a hot climb ; the sun blazing over-head ; the cliffs reflecting light and heat ; the white débris glaring under-foot. Some of the tombs up here are excavated in terraces, and look from a distance like rows of pigeon holes ; others are pierced in solitary ledges of rock ; many are difficult of access ; all are intolerably hot and oppressive. They were numbered half a century ago by the late Sir Gardner Wilkinson, and the numbers are there still. We went that morning into 14, 16, 17, and 35. As a child "The Manners and Customs of the Ancient Egyptians" had shared my affections with "The Arabian Nights." I had read every line of the old six-volume edition over and over again. I knew every one of the six hundred illustrations by heart. Now I suddenly found myself in the midst of old and half-forgotten friends. Every subject on these wonderful walls was already familiar to me. Only the framework, only the colouring, only the sand under-foot, only the mountain slope outside, were new and strange. It seemed to me that I had met all these kindly brown people years and years ago – perhaps in some previous stage of existence ; that I had walked with them in their gardens ; listened at the music of their lutes and tambourines ; pledged them at their feasts. Here is the funeral procession that I know so well ; and the trial scene after death, where the mummy stands upright in the presence of Osiris, and sees his heart weighed in the balance. Here is that well-remembered old fowler crouching in the rushes with his basket of decoys. One withered hand is lifted to his mouth ; his lips frame the call ; his thin hair blows in the breeze. I see now that he has placed himself to the leeward of the game ; but that subtlety escaped me in the reading days of my youth. Yonder I recognise a sculptor's studio into which I frequently peeped at that time. His men are at work as actively as ever ; but I marvel that they have not yet finished polishing the surface of that red-granite colossus. This patient angler, still waiting for a bite, is another old acquaintance ; and yonder, I declare, is that evening party at which I was so often an imaginary guest! Is the feast not yet over? Has that late comer whom we saw hurrying along just now in a neighbouring corridor not yet arrived? Will the musicians never play to the end of their concerto? Are those ladies still so deeply interested in the patterns of one another's ear-rings? It seems to me that the world has been standing still in here for these last five-and-thirty years. Did I say five-and-thirty? Ah me! I think we must multiply it by ten, and then by ten again, ere we come to the right figure. These people lived in the time of the Thothmes and the Amenhoteps – a time upon which Rameses the Great looked back as we look back to the days of the Tudors and the Stuarts. From the tombs above, we went back to the excavations below. The bricked-up opening had led, as the diggers expected, into a second vault ; and another mummy-case, half-crushed by a fall of débris, had just been taken out. A third was found later in the afternoon. Curiously enough, they were all three mummies of women. The Governor was taking his luncheon with the first mummy in the recesses of the stable, which had been a fine tomb once, but reeked now with manure. He sat on a rug, cross-legged, with a bowl of sour milk before him and a tray of most uninviting little cakes. He invited me to a seat on his rug, handed me his own spoon, and did the honours of the stable as pleasantly as if it had been a palace. I asked him why the excavators, instead of working among these second-class graves, were not set to search for the tombs of the Kings of the XVIIIth Dynasty, supposed to be waiting discovery in a certain valley called the Valley of the West. He shook his head. The way to the Valley of the West, he said, was long and difficult. Men working there must encamp upon the spot ; and merely to supply them with water would be no easy matter. He was allowed, in fact, only a sum sufficient for the wages of fifty excavators ; and to attack the Valley of the West with less than two hundred would be useless. We had luncheon that morning, I remember, with the M. B. 's in the second hall of the Ramesseum. It was but one occasion among many ; for the Writer was constantly at work on that side of the river, and we had luncheon in one or other of the western Temples every day. Yet that particular meeting stands out in my memory apart from the rest. I see the joyous party gathered together in the shade of the great columns – the Persian rugs spread on the uneven ground – the dragoman in his picturesque dress going to and fro – the brown and tattered Arabs, squatting a little way off, silent and hungry-eyed, each with his string of forged scarabs, his imitation gods, or his bits of mummy-case and painted cartonnage for sale – the glowing peeps of landscape framed in here and there through vistas of columns – the emblazoned architraves laid along from capital to capital overhead, each block sculptured with enormous cartouches yet brilliant with vermilion and ultramarine – the patient donkeys munching all together at a little heap of vetches in one corner – the intense depths of cloudless blue above. Of all Theban ruins, the Ramesseum is the most cheerful. Drenched in sunshine, the warm limestone of which it is built seems to have mellowed and turned golden with time. No walls enclose it. No towering pylons overshadow it. It stands high, and the air circulates freely among those simple and beautiful columns. There are not many Egyptian ruins in which one can talk and be merry ; but in the Ramesseum one may thoroughly enjoy the passing hour. Whether Rameses the Great was ever actually buried in this place is a problem which future discoveries may possibly solve ; but that the Ramesseum and the tomb of Osymandias were one and the same building is a point upon which I never entertained a moment's doubt. Spending day after day among these ruins ; sketching now here, now there ; going over the ground bit by bit, and comparing every detail, I came at last to wonder how an identity so obvious could ever have been doubted. Diodorus was of course inaccurate ; but then one as little looks for accuracy in Diodorus as in Homer. 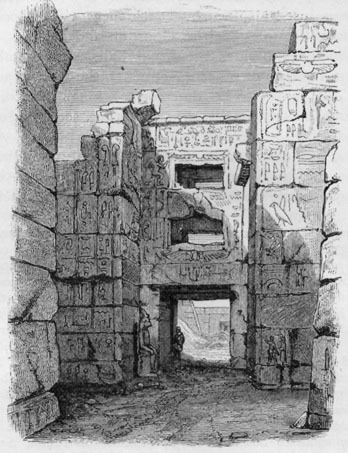 Compared with some of his topographical descriptions, the account he gives of the Ramesseum is a marvel of exactness. He describes2 a building approached by two vast courtyards ; a hall of pillars opening by way of three entrances from the second courtyard ; a succession of chambers, including a sacred library ; ceilings of azure "bespangled with stars" ; walls covered with sculptures representing the deeds and triumphs of the king whom he calls Osymandias,3 amongst which are particularly noticed the assault of a fortress "environed by a river," a procession of captives without hands, and a series of all the Gods of Egypt, to whom the king was represented in the act of making offerings ; finally, against the entrance to the second courtyard, three statues of the King, one of which, being of syenite granite and made "in a sitting posture," is stated to be not only "the greatest in all Egypt," but admirable above all others "for its workmanship, and the excellence of the stone." Bearing in mind that what is left of the Ramesseum is, as it were, only the backbone of the entire structure, one can still walk from end to end of the building, and still recognise every feature of this description. We turn our backs on the wrecked towers of the first propylon ; crossing what was once the first courtyard, we leave to the left the fallen colossus ; we enter the second courtyard, and see before us the three entrances to the hall of pillars, and the remains of two other statues ; we walk up the central avenue of the great hall, and see above our heads architraves studded with yellow stars upon a ground colour so luminously blue that it almost matches the sky ; thence, passing through a chamber lined with sculptures, we come to the library, upon the door-jambs of which Champollion found the figures of Thoth and Saf, the Lord of Letters and the Lady of the Sacred Books ;4 finally, among such fragments of sculptured decoration as yet remain, we find the King making offerings to a hieroglyphed list of Gods as well as to his deified ancestors ; we see the train of captives, and the piles of severed hands ;5 and we discover an immense battle-piece, which is in fact a replica of the famous battle-piece at Abou Simbel. This subject, like its Nubian prototype, yet preserves some of its colour. The enemy are shown to be fair-skinned and light-haired, and wear the same Syrian robes ; and the river, more green than that at Abou Simbel, is painted in zigzags in the same manner. The King, alone in his chariot, sends arrow after arrow against the flying foe. They leap into the river, and swim for their lives. Some are drowned ; some cross in safety, and are helped out by their friends on the opposite bank. A red-haired chief, thus rescued, is suspended head-downwards by his soldiers, in order to let the water that he has swallowed run out of his mouth. The river is once more the Orontes ; the city is once more Kadesh ; the king is once more Rameses II ; and the incidents are again the incidents of the poem of Pentaur. OSIRIDE COURT AND FALLEN COLOSSUS, RAMESSEUM, THEBES. Ruined almost beyond recognition as it is, one never doubts for a moment that this statue was one of the wonders of Egyptian workmanship. It most probably repeated in every detail the colossi of Abou Simbel ; but it surpassed them as much in finish of carving as in perfection of material. The stone is even more beautiful in colour than that of the famous obelisks of Karnak ; and is so close and hard in grain, that the scarab-cutters of Luxor are said to use splinters of it as our engravers use diamonds, for the points of their graving tools. The solid contents of the whole, when entire, are calculated at 887 tons. How this astounding mass was transported from Assûan, how it was raised, how it was overthrown, are problems upon which a great deal of ingenious conjecture has been wasted. One traveller affirms that the wedge-marks of the destroyer are distinctly visible. Another, having carefully examined the fractured edges, declares that the keenest eye can detect neither wedge-marks nor any other evidences of violence. We looked for none of these signs and tokens. We never asked ourselves how or when the ruin had been done. It was enough that the mighty had fallen. Inasmuch as one can clamber upon and measure these stupendous fragments, the fallen colossus is more astonishing, perhaps, as a wreck than it would have been as a whole. Here, snapped across at the waist and flung helplessly back, lie a huge head and shoulders, to climb which is like climbing a rock. Yonder, amid piles of unintelligible débris, we see a great foot, and nearer the head, part of an enormous trunk, together with the upper halves of two huge thighs clothed in the usual shenti or striped tunic. The klaft or headdress is also striped, and these stripes, in both instances, retain the delicate yellow colour with which they were originally filled in. To judge from the way in which this colour was applied, one would say that the statue was tinted rather than painted. The surface-work, wherever it remains, is as smooth and highly finished as the cutting of the finest gem. Even the ground of the superb cartouche, on the upper half of the arm, is elaborately polished. Finally, in the pit which it ploughed out in falling, lies the great pedestal, hieroglyphed with the usual pompous titles of Rameses Mer-Amen. Diodorus, knowing nothing of Rameses or his style, interprets the inscription after his own fanciful fashion : – "I am Osymandias, King of Kings. If any would know how great I am, and where I lie, let him excel me in any of my works." The fragments of wall and shattered pylon that yet remain standing at the Ramesseum face N.W. and S.W. Hence it follows that some of the most interesting of the surface sculpture (being cut in very low relief) is so placed with regard to the light as to be actually invisible after midday. It was not till the occasion of my last visit, when I came early in the morning to make a certain sketch by a certain light, that I succeeded in distinguishing a single figure of that celebrated tableau,8 on the south wall of the Great Hall, in which the Egyptians are seen to be making use of the testudo and scaling ladder to assault a Syrian fortress. The wall sculptures of the second hall are on a bolder scale, and can be seen at any hour. Here Thoth writes the name of Rameses on the egg-shaped fruit of the persea tree, and processions of shaven priests carry on their shoulders the sacred boats of various Gods. In the centre of each boat is a shrine supported by winged genii, or cherubim. The veils over these shrines, the rings through which the bearing-poles were passed, and all the appointments and ornaments of the bari, are distinctly shown. One seems here, indeed, to be admitted to a glimpse of those original shrines upon which Moses – learned in the sacred lore of the Egyptians – modelled, but with little alteration, his Ark of the Covenant. Next in importance to Karnak, and second in interest to none of the Theban ruins, is the vast group of buildings known by the collective name of Medinet Habu. To attempt to describe these would be to undertake a task as hopeless as the description of Karnak. Such an attempt lies, at all events, beyond the compass of these pages, so many of which have already been given to similar subjects. For it is of Temples as of mountains – no two are alike, yet all sound so much alike when described that it is scarcely possible to write about them without becoming monotonous. In the present instance, therefore, I will note only a few points of special interest, referring those who wish for fuller particulars to the elaborate account of Medinet Habu in Murray's Handbook of Egypt. In the second name of Medinet Habu – Medinet being the common Arabic for city, and Habu, Aboo, or Taboo being variously spelled – there survives almost beyond doubt the ancient name of that famous city which the Greeks called Thebes. It is a name for which many derivations9 have been suggested, but upon which the learned are not yet agreed. The ruins of Medinet Habu consist of a smaller Temple founded by Queen Hatohepsu of the XVIIIth Dynasty, a large and magnificent Temple entirely built by Rameses III of the XXth Dynasty, and an extremely curious and interesting building, part palace, part fortress, which is popularly known as the Pavilion. The walls of this pavilion, the walls of the great forecourt leading to the smaller Temple, and a corner of the original wall of circuit, are crowned in the Egyptian style with shield-shaped battlements, precisely as the Khetan and Amorite fortresses are battlemented in the sculptured tableaux at Abou Simbel and elsewhere. From whichever side one approaches Medinet Habu, these stone shields strike the eye as a new and interesting feature. They are, moreover, so far as I know, the only specimens of Egyptian battlementing which have survived destruction. Those of the wall of circuit are of the time of Rameses V ; those of the pavilion, of the time of Rameses III ; and the latest, which are those of the forecourt, are of the period of Roman occupation. 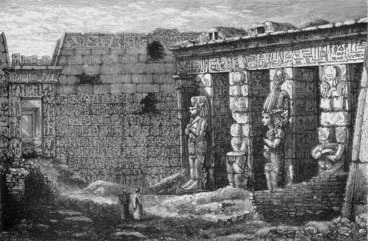 It may be that before the time of this Pharaoh certain Temples were used also as royal residences. It is possible to believe this of Temples such as Gournah and Abydus, the plan of which includes, besides the usual halls, side-chambers, and sanctuary, a number of other apartments, the uses of which are unknown. It may also be that former kings dwelt in houses of brick and carved woodwork, such as we see represented in the wall-paintings of various tombs. It is at all events a fact that the only building which we can assume to have been a royal palace, and of which any vestiges have come down to the present day, was erected by Rameses III, namely, this little pavilion at Medinet Habu. PALACE ENTRANCE – MEDINET HABU. It may not have been a palace. It may have been only a fortified gate ; but though the chambers are small, they are well lighted, and the plan of the whole is certainly domestic in character. It consists, as we now see it, of two lodges connected by zigzag wings with a central tower. The lodges and tower stand to each other as the three points of an acute angle. These structures enclose an oblong courtyard leading by a passage under the central tower to the sacred enclosure beyond. So far as its present condition enables us to judge, this building contained only eight rooms ; namely three, one above the other, in each of the lodges, and two over the gateway. 12 These three towers communicate by means of devious passages in the connecting wings. Two of the windows in the wings are adorned with balconies supported on brackets ; each bracket representing the head and shoulders of a crouching captive, in the attitude of a gargoyle. The heads and dresses of these captives – conceived as they are in a vein of Gothic barbarism – are still bright with colour. The central, or gateway-tower, is substantially perfect. The Writer, with help, got as high as the first chamber ; the ceiling of which is painted in a rich and intricate pattern, as in imitation of mosaic. The top room is difficult of access ; but can be reached by a good climber. Our friend F. W. S., who made his way up there a year or two before, found upon the walls some interesting sculptures of cups and vases, apparently part of an illustrated inventory of domestic utensils. Three of these (unlike any engraved in the works of Wilkinson or Rosellini) are here reproduced from his sketch made upon the spot. The lid of the smaller vase, it will be observed, opens by means of a lever spooned out for the thumb to rest in, just like the lid of a German beer-mug of the present day. The external decorations of the two lodges are of especial interest. The lower subjects are historical. Those upon the upper storeys are domestic or symbolical, and are among the most celebrated of Egyptian bas-reliefs. They have long been supposed to represent Rameses III in his hareem, entertained and waited upon by female slaves. In one group the king, distinguished always by his cartouches, sits at ease in a kind of folding chair, his helmet on his head, his sandalled feet upon a footstool, as one returned and resting after battle. In his left hand he holds a round object like a fruit. With the right he chucks under the chin an ear-ringed and necklaced damsel who presents a lotus blossom at his nose. In another much mutilated subject, they are represented playing a game at draughts. This famous subject – which can only be seen when the light strikes sidewise – would scarcely be intelligible save for the help one derives from the cuts in Wilkinson and the plates in Rosellini. It is not that the sculptures are effaced, but that the great blocks which bore them are gone from their places, having probably been hurled down bodily upon the heads of the enemy during a certain siege of which the ruins bear evident traces. 13 Of the lady, there remains little beside one arm and the hand that holds the pawn. The table has disappeared. The king has lost his legs. It happens, however, though the table is missing, that the block next above it contained the pawns, which can still be discerned from below by the help of a glass. Rosellini mentions three or four more subjects of a similar character, including a second group of draught-players, all visible in his time. The Writer, however, looked for them in vain. These tableaux are supposed to illustrate the home-life of Rameses III, and to confirm the domestic character of the pavilion. Even the scarab-selling Arabs that haunt the ruins, even the donkey-boys of Luxor, call it the Hareem of the Sultan. Modern science, however, threatens to dispel one at least of these pleasant fancies. Below these great groups run friezes sculptured with kneeling figures of vanquished chiefs, among whom are Libyan, Sicilian, Sardinian, and Etruscan leaders. Every head in these friezes is a portrait. The Libyan is beardless ; his lips are thin ; his nose is hooked ; his forehead retreats ; he wears a close-fitting cap with a pendant hanging in front of the ear. The features of the Sardinian chief 18 are no less Asiatic. He wears the usual Sardinian helmet surmounted by a ball and two spikes. The profile of the Sicilian closely resembles that of the Sardinian. He wears a headdress like the modern Persian cap. As ethnological types, these heads are extremely valuable. Colonists not long since departed from the western coasts of Asia Minor, these early European settlers are seen with the Asiatic stamp of features ; a stamp which has now entirely disappeared. Other European nations are depicted elsewhere in these Medinet Habu sculptures. Pelasgians from the Greek isles, Oscans perhaps from Pompeii, Daunians from the districts between Tarentum and Brundusium, figure here, each in their national costume. Of these, the Pelasgian alone resembles the modern European. On the left wall of the pavilion gateway, going up towards the Temple, there is a large bas-relief of Rameses III leading a string of captives into the presence of Amen-Ra. Among these, the sculptures being in a high state of preservation, there are a number of Pelasgians, some of whom have features of the classical Greek type, and are strikingly handsome. The Pelasgic headdress resembles our old infantry shako ; and some of the men wear disk-shaped amulets pierced with a hole in the centre, through which is passed the chain that suspends it round the neck. The inner walls of this great courtyard, and the outer face of the north-east wall, are covered with sculptures outlined, so to say, in intaglio, and relieved in the hollow, so that the forms, though rounded, remain level with the general surface. In these tableaux the old world lives again. Rameses III, his sons and nobles, his armies, his foes, play once more the brief drama of life and death. Great battles are fought ; great victories are won ; the slain are counted ; the captured drag their chains behind the victor's chariot ; the king triumphs, is crowned, and sacrifices to the Gods. Elsewhere more wars ; more slaughter. There is revolt in Libya ; there are raids on the Asiatic border ; there are invaders coming in ships from the islands of the Great Sea. The royal standard is raised ; troops assemble ; arms are distributed. Again the king goes forth in his might, followed by the flower of Egyptian chivalry. "His horsemen are heroes ; his foot soldiers are as lions that roar in the mountains." The king himself flames "like Mentu in his hour of wrath." He falls upon the foe "with the swiftness of a meteor." Here, crowded in rude bullock-trucks, they seek safety in flight. Yonder their galleys are sunk ; their warriors are slain, drowned, captured, scathed, as it were, in a devouring fire. "Never again will they sow seed or reap harvest on the fair face of the earth." The Writer pitched her tent in the doorway of the first propylon, and thence sketched the north-west corner of the courtyard, including the tower with the inscription and the Osiride colossi. The accompanying illustration faithfully reproduces that sketch. The roof of the colonnade to the right is cumbered with crude-brick ruins of mediæval date. The hieroglyphs, sculptured along the architrave and down the sides of the pillars, are still bright with colour. The colossi are all the worse for 3000 years of ill-usage. Through the sculptured doorway opposite, one looks across the Hypæthral Court, and catches a glimpse of the ruined Hall of Pillars beyond. While the Writer was at work in the shade of the first pylon, an Arab story-teller took possession of that opposite doorway, and entertained the donkey-boys and sailors. Well paid with a little tobacco and a few copper piastres, he went on for hours, his shrill chant rising every now and then to a quavering scream. He was a wizened, grizzled old fellow, miserably poor and tattered ; but he had the Arabian Nights and hundreds of other tales by heart. Mariette was of opinion that the Temple of Medinet Habu, erected as it is on the side of the great Theban necropolis, is, like the Ramesseum, a funerary monument erected by Rameses III in his own lifetime to his own memory. These battered colossi represent the king in the character of Osiris, and are in fact on a huge scale precisely what the ordinary funerary statuettes are upon a small scale. They would be out of place in any but a monumental edifice ; and they alone suffice to determine the character of the building. And such, no doubt, was the character of the Amenophium ; of the little Temple called Dayr el Medinet ; of the Temple of Queen Hatshepsu, known as Dayr el Bahari ; of the Temple of Gournah ; of almost every important structure erected upon this side of the river. 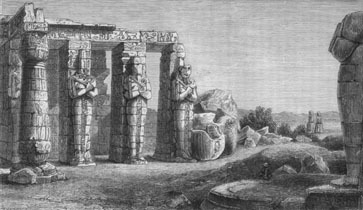 Of the Amenophium there remain only a few sculptured blocks, a few confused foundations, and – last representatives of an avenue of statues of various sizes – the famous Colossi of the Plain. 22 The Temple of Dayr el Bahari – built in terraces up the mountain side, and approached once upon a time by a magnificent avenue of sphinxes, the course of which is yet visible – would probably be, if less ruined, the most interesting temple on the western side of the river. The monumental intention of this building is shown by its dedication to Hathor, the Lady of Amenti ; and by the fact that the tomb of Queen Hatshepsu was identified by Rhind some twenty-five years ago as one of the excavated sepulchres in the cliff-side, close to where the temple ends by abutting against the rock. As for the Temple of Gournah, it is, at least in part, as distinctly a memorial edifice as the Medici Chapel at Florence or the Superga at Turin. It was begun by Seti I in memory of his father Rameses I, the founder of the XIXth Dynasty. Seti, however, died before the work was completed. Hereupon Rameses II, his son and successor, extended the general plan, finished the part dedicated to his grandfather, and added sculptures to the memory of Seti I. Later still, Menepthah, the son and successor of Rameses II, left his cartouches upon one of the doorways. The whole building, in short, is a family monument, and contains a family portrait gallery. Here all the personages whose names figure in the shrines of the Ramessides at Silsilis are depicted in their proper persons. In one tableau, Rameses I, defunct, deified, 23 swathed, enshrined, and crowned like Osiris, is worshipped by Seti I. Behind Seti stands his Queen Tuaa, the mother of Rameses II. Elsewhere Seti I, being now dead, is deified and worshipped by Rameses II, who pours a libation to his father's statue. Through all these handsome heads there runs a striking family likeness. All more or less partake of that Dantesque type which characterises the portraits of Rameses II in his youth. The features of Rameses I and Seti I are somewhat pinched and stern, like the Dante of elder days. The delicate profile of Queen Tuaa, which is curiously like some portraits of Queen Elizabeth, is perhaps too angular to be altogether pleasing. But in the well-known face of Rameses II these harsher details vanish and the beauty of the race culminates. The artists of Egyptian Renaissance, always great in profile-portraiture, are nowhere seen to better advantage than in this interesting series. Adjoining what may be called the monumental part of the building, we find a number of halls and chambers, the uses of which are unknown. Most writers assume that they were the private apartments of the King. Some go so far as to give the name of Temple-Palaces to all these great funerary structures. It is, however, far more probable that these Western Temples were erected in connection, though not in direct communication, with the royal tombs in the adjacent valley of Bab-el-Molûk. Now every Egyptian tomb of importance has its outer chamber or votive oratory, the walls of which are covered with paintings descriptive, in some instances, of the occupations of the deceased upon earth, and in others of the adventures of his soul after death. Here at stated seasons the survivors repaired with offerings. No priest, it would seem, of necessity officiated at these little services. A whole family would come, bringing the first fruits of their garden, the best of their poultry, cakes of home-made bread, bouquets of lotus blossoms. With their own hands they piled the altar ; and the eldest son, as representative of the rest, burned the incense and poured the libations. It is a scene constantly reproduced upon monuments 24 of every epoch. These votive oratories, however, are wholly absent in the valley of Bab-el-Molûk. The royal tombs consist of only tunnelled passages and sepulchral vaults ; the entrances to which were closed for ever as soon as the sarcophagus was occupied ; hence it may be concluded that each memorial temple played to the tomb of its tutelary saint and sovereign that part which is played by the external oratory attached to the tomb of a private individual. Nor must it be forgotten that as early as the time of the Pyramid Kings, there was a votive chapel attached to every pyramid, the remains of which are traceable in almost every instance, on the east side. There were also priests of the pyramids, as we learn from innumerable funerary inscriptions. The wall-sculptures at Gournah are extremely beautiful, especially those erected by Seti I. Where it has been accidentally preserved, the surface is as smooth, the execution as brilliant, as the finest mediæval ivory carving. Behind a broken column, for instance, that leans against the south west wall of the sanctuary, 26 one may see, by peeping this way and that, the ram's-head prow of a sacred boat, quite unharmed, and of surpassing delicacy. The modelling of the ram's head is simply faultless. It would indeed be scarcely too much to say that this one fragment, if all the rest had perished, would alone place the decorative sculpture of ancient Egypt in a rank second only to that of Greece. The Temple of Gournah – northernmost of the Theban group – stands at the mouth of that famous valley called by the Arabs Bab-el-Molûk,27 and by travellers, the Valley of the Tombs of the Kings. This valley may be described as a bifurcated ravine, ending in two culs de sacs, and hemmed in on all sides by limestone precipices. It winds round behind the cliffs which face Luxor and Karnak, and runs almost parallel with the Nile. This range of cliffs is perforated on both sides with tombs. The priests and nobles of many dynasties were buried terrace above terrace on the side next the river. Back to back with them, in the silent and secret valley beyond, slept the kings in their everlasting sepulchres. Most travellers moor for a day or two at Karnak, and thence make their excursion to Bab-el-Molûk. By so doing they lose one of the most interesting rides in the neighbourhood of Thebes. L. and the Writer started from Luxor one morning about an hour after daybreak, crossing the river at the usual point and thence riding northwards along the bank, with the Nile on the one hand, and the corn-lands on the other. In the course of such rides, one discovers the almost incredible fertility of the Thebaid. Every inch of arable ground is turned to account. All that grows, grows lustily. The barley ripples in one uninterrupted sweep from Medinet Habu to a point half-way between the Ramesseum and Gournah. Next come plantations of tobacco, cotton, hemp, linseed, maize and lentils, so closely set, so rich in promise, that the country looks as if it were laid out in allotment grounds for miles together. Where the rice crop has been gathered, clusters of temporary huts have sprung up in the clearings ; for the fellahîn come out from their crowded villages in "the sweet o' the year," and live in the midst of the crops which now they guard, and which presently they will reap. The walls of these summer huts are mere wattled fences of Indian corn straw, with bundles of the same laid lightly across the top by way of roofing. This pastoral world is everywhere up and doing. Here are men plying the shâdûf by the river's brink ; women spinning in the sun ; children playing ; dogs barking ; larks soaring and singing overhead. Against the foot of the cliffs yonder, where the vegetation ends and the tombs begin, there flows a calm river edged with palms. A few months ago, we should have been deceived by that fairy water. We know now that it is the mirage. Striking off by and by towards the left, we make for a point where the mountains recede and run low, and a wedge-like "spit" of sandy desert encroaches upon the plain. On the verge of this spit stands a clump of sycamores and palms. A row of old yellow columns supporting a sculptured architrave gleams through the boughs ; a little village nestles close by ; and on the desert slope beyond, in the midst of a desolate Arab burial-ground, we see a tiny mosque with one small cupola dazzling white in the sunshine. This is Gournah. There is a spring here, and some girls are drawing water from the well near the Temple. Our donkeys slake their thirst from the cattle-trough – a broken sarcophagus that may once have held the mummy of a king. A creaking sakkieh is at work yonder, turned by a couple of red cows with mild Hathor-like faces. The old man who drives them sits in the middle of the cog-wheel, and goes slowly round as if he was being roasted. We now leave behind us the well, and the trees, and the old Greek-looking Temple, and turn our faces westward, bound for an opening yonder among cliffs pitted with the mouths of empty tombs. It is plain to see that we are now entering upon what was once a torrent-bed. Rushing down from the hills, the pent-up waters have here spread fan-like over the slope of the desert, strewing the ground with boulders, and ploughing it into hundreds of tortuous channels. Up that torrent-bed lies our road to-day. The weird rocks stand like sentinels to right and left as one enters the mouth of the valley, and take strange shapes as of obelisks and sphinxes. Some, worn at the base, and towering like ruined pyramids above, remind us of tombs on the Appian Way. As the ravine narrows, the limestone walls rise higher. The chalky track glares under-foot. Piles of shivered chips sparkle and scintillate at the foot of the rocks. The cliffs burn at a white heat. The atmosphere palpitates like gaseous vapour. The sun blazes overhead. Not a breath stirs ; neither is there a finger's breadth of shade on either side. It is like riding into the mouth of a furnace. Meanwhile, one looks in vain for any sign of life. No blade of green has grown here since the world began. No breathing creature makes these rocks its home. All is desolation – such desolation as one dreams of in a world scathed by fire from heaven. When we have gone a long way, always tracking up the bed of the torrent, we come to a place where our donkeys turn off from the main course and make for what is evidently a forced passage cut clean through a wall of solid limestone. The place was once a mere recess in the cliffs ; but on the farther side, masked by a natural barrier of rock, there lay another valley leading to a secluded amphitheatre among the mountains. The first Pharaoh who chose his place of burial among those hidden ways, must have been he who cut the pass and levelled the road by which we now travel. This cutting is Bab-el-Molûk – the Gate of the King ; a name which doubtless perpetuates that by which the place was known to the old Egyptians. Once through the Gate, a grand mountain rises into view. Egypt is the land of strange mountains ; and here is one which reproduces on a giant scale every feature of the pyramid of Ouenephes at Sakkarah. It is square ; it rises stage above stage in ranges of columnar cliffs with slopes of débris between ; and it terminates in a blunt four-sided peak nearly 1800 feet above the level of the plain. Keeping this mountain always before us, we now follow the windings of the second valley, which is even more narrow, parched, and glaring than the first. Perhaps the intense heat makes the road appear longer than it really is ; but it seems to us like several miles. At length the uniformity of the way is broken. Two small ravines branch off, one to the right, one to the left ; and in both, at the foot of the rocks, there are here and there to be seen square openings, like cellar-doors, half sunk below the surface, and seeming to shoot downwards into the bowels of the earth. In another moment or so, our road ends suddenly in a wild tumbled waste, like an exhausted quarry, shut in all round by impending precipices, at the base of which more rock-cut portals peep out at different points. From the moment when it first came into sight, I had made certain that in that pyramidal mountain we should find the Tombs of the Kings – so certain, that I can scarcely believe our guide when he assures us that these cellars are the places we have come to see, and that the mountain contains not a single tomb. We alight, however ; climb a steep slope ; and find ourselves on the threshold of No. 17. "Belzoni-tomb," says our guide ; and Belzoni's tomb, as we know, is the tomb of Seti the First. I am almost ashamed to remember now that we took our luncheon in the shade of that solemn vestibule, and rested and made merry, before going down into the great gloomy sepulchre whose staircases and corridors plunged away into the darkness below, as if they led straight to the land of Amenti. The tombs in the Valley of Bab-el-Molûk are as unlike the tombs in the cliffs opposite Luxor as if the Theban kings and the Theban nobles were of different races and creeds. Those sacred scribes and dignitaries, with their wives and families and their numerous friends and dependants, were a joyous set. They loved the things of this life, and would fain have carried their pursuits and pleasures with them into the land beyond the grave. So they decorated the walls of their tombs with pictures of the way in which their lives were spent, and hoped perhaps that the mummy, dreaming away its long term of solitary waiting, might take comfort in those shadowy reminiscences. The kings, on the contrary, covered every foot of their last palaces with scenes from the life to come. The wanderings of the soul after its separation from the body, the terrors and dangers that beset it during its journey through Hades, the demons it must fight, the accusers to whom it must answer, the transformations it must undergo, afforded subjects for endless illustration. Of the fishing and fowling and feasting and junketing that we saw the other day in those terraces behind the Ramesseum, we discover no trace in the tombs of Bab-el-Molûk. In place of singing and lute-playing, we find here prayers and invocations ; for the pleasant Nile-boat, and the water-parties, and the chase of the gazelle and the ibex, we now have the bark of Charon, and the basin of purgatorial fire, and the strife with the infernal deities. The contrast is sharp and strange. It is as if an Epicurean aristocracy had been ruled by a line of Puritan kings. The tombs of the subjects are Anacreontics. The tombs of their sovereigns are penitential psalms. To go down into one of these great sepulchres is to descend one's-self into the Lower World, and to tread the path of the shades. Crossing the threshold, we look up – half-expecting to read those terrible words in which all who enter are warned to leave hope behind them. The passage slopes before our feet ; the daylight fades behind us. At the end of the passage comes a flight of steps, and from the bottom of that flight of steps we see another corridor slanting down into depths of utter darkness. The walls on both sides are covered with close-cut columns of hieroglyphic text, interspersed with ominous shapes, half-deity, half-demon. Huge serpents writhe beside us along the walls. Guardian spirits of threatening aspect advance, brandishing swords of flame. A strange heaven opens overhead – a heaven where the stars travel in boats across the seas of space ; and the Sun, escorted by the hours, the months, and the signs of the zodiac, issues from the East, sets in the West, and traverses the hemisphere of Everlasting Night. We go on, and the last gleam of daylight vanishes in the distance. Another flight of steps leads now to a succession of passages and halls, some smaller, some larger, some vaulted, some supported on pillars. Here yawns a great pit half full of débris. Yonder opens a suite of unfinished chambers abandoned by the workmen. The farther we go, the more weird become our surroundings. The walls swarm with ugly and evil things. Serpents, and bats, and crocodiles, some with human heads and legs, some vomiting fire, some armed with spears and darts, pursue and torture the wicked. These unfortunates have their hearts torn out ; are boiled in cauldrons ; are suspended head downwards over seas of flame ; are speared, decapitated, and driven in headless gangs to scenes of further torment. Beheld by the dim and shifting light of a few candles, these painted horrors assume an aspect of ghastly reality. They start into life as we pass, then drop behind us into darkness. That darkness alone is awful. The atmosphere is suffocating. The place is ghostly and peopled with nightmares. Coming out for a moment into blinding daylight, we drink a long draught of pure air, cross a few yards of uneven ground, arrive at the mouth of another excavation, and plunge again into underground darkness. A third and a fourth time we repeat this strange experience. It is like a feverish sleep troubled by gruesome dreams, and broken by momentary wakings. These tombs in a general way are very much alike. Some are longer than others ; 30 some loftier. In some the descent is gradual ; in others it is steep and sudden. Certain leading features are common to all. The great serpent, 31 the scarab, 32 the bat, 33 the crocodile, 34 are always conspicuous on the walls. The judgment-scene, and the well-known typical picture of the four races of mankind, are continually reproduced. Some tombs,35 however, vary both in plan and decoration. That of Rameses III, though not nearly so beautiful as the tomb of Seti I, is perhaps the most curious of all. The paintings here are for the most part designed on an unsculptured surface coated with white stucco. The drawing is often indifferent, and the colouring is uniformly coarse and gaudy. Yellow abounds ; and crude reds and blues remind us of the coloured picture-books of our childhood. It is difficult to understand, indeed, how the builder of Medinet Habu, with the best Egyptian art of the day at his command, should have been content with such wall-paintings as these. Still Rameses III seems to have had a grand idea of going in state to the next world, with his retainers around him. In a series of small antechambers opening off from the first corridor, we see depicted all the household furniture, all the plate, the weapons, the wealth and treasure of the king. Upon the walls of one the cooks and bakers are seen preparing the royal dinner. In the others are depicted magnificent thrones ; gilded galleys with parti-coloured sails ; gold and silver vases ; rich store of arms and armour ; piles of precious woods, of panther skins, of fruits, and birds, and curious baskets, and all such articles of personal luxury as a palace-building Pharaoh might delight in. Here also are the two famous harpers ; cruelly defaced, but still sweeping the strings with the old powerful touch that erewhile soothed the king in his hours of melancholy. These two spirited figures – which are undoubtedly portraits 36 – almost redeem the poverty of the rest of the paintings. In many tombs, the empty sarcophagus yet occupies its ancient place. 37 We saw one in No. 2 (Rameses IV), and another in No. 9 (Rameses VI) ; the first, a grand monolith of dark granite, overturned and but little injured ; the second, shattered by early treasure-seekers. Most of the tombs at Bab-el-Molûk were open in Ptolemaic times. Being then, as now, among the stock sights and wonders of Thebes, they were visited by crowds of early travellers, who have as usual left their neatly-scribbled graffiti on the walls. When and by whom the sepulchres were originally violated is of course unknown. Some, doubtless, were sacked by the Persians ; others were plundered by the Egyptians themselves, long enough before Cambyses. Not even in the days of the Ramessides, though a special service of guards was told off for duty in "the Great Valley," were the kings safe in their tombs. During the reign of Rameses IX – whose own tomb is here, and known as No. 6 – there seems to have been an organised band, not only of robbers, but of receivers, who lived by depredations of the kind. A contemporary papyrus 38 tells how in one instance the royal mummies were found lying in the dust, their gold and silver ornaments, and the treasures of their tombs, all stolen. In another instance, a king and his queen were carried away bodily, to be unrolled and rifled at leisure. This curious information is all recorded in the form of a report, drawn up by the Commandant of Western Thebes, who, with certain other officers and magistrates, officially inspected the tombs of the "Royal Ancestors" during the reign of Rameses IX. No royal tomb has been found absolutely intact in the valley of Bab-el-Molûk. Even that of Seti the First had been secretly entered ages before ever Belzoni discovered it. He found in it statues of wood and porcelain, and the mummy of a bull ; but nothing of value save the sarcophagus, which was empty. There can be no doubt that the priesthood were largely implicated in these contemporary sacrileges. Of thirty-nine persons accused by name in the papyrus just quoted, seven are priests, and eight are sacred scribes. To rob the dead was always a lucrative trade at Thebes ; and we may be certain that the splendid Pharaohs who slept in the Valley of the Tombs of the Kings, 39 went to their dark palaces magnificently equipped for the life to come. 40 When, indeed, one thinks of the jewels, furniture, vases, ointments, clothing, arms, and precious documents which were as certainly buried in those tombs as the royal mummies for whom they were excavated, it seems far more wonderful that the parure of one queen should have escaped, rather than that all the rest of these dead and gone royalties should have fallen among thieves. Of all tombs in the Valley of Bab-el-Molûk, one would rather, I think, have discovered that of Rameses III. As he was one of the richest of the Pharaohs 41 and an undoubted virtuoso in his tastes, so we may be sure that his tomb was furnished with all kinds of beautiful and precious things. What would we not give now to find some of those elaborate gold and silver vases, those cushioned thrones and sofas, those bows and quivers and shirts of mail so carefully catalogued on the walls of the side-chambers in the first corridor! I do not doubt that specimens of all these things were buried with the king and left ready for his use. He died, believing that his Ka would enjoy and make use of these treasures, and that his soul would come back after long cycles of probation, and make its home once more in the mummied body. He thought he should rise as from sleep ; cast off his bandages ; eat and be refreshed, and put on sandals and scented vestments, and take his staff in his hand, and go forth again into the light of everlasting day. Poor ghost, wandering bodiless through space! where now are thy funeral-baked meats, thy changes of raiment, thy perfumes and precious ointments? Where is that body for which thou wert once so solicitous, and without which resurrection 42 is impossible? One fancies thee sighing forlorn through these desolate halls when all is silent and the moon shines down the valley. Life at Thebes is made up of incongruities. A morning among temples is followed by an afternoon of antiquity-hunting ; and a day of meditation among tombs winds up with a dinner-party on board some friend's dahabeeyah, or a fantasia at the British Consulate. L. and the Writer did their fair share of antiquity-hunting both at Luxor and elsewhere ; but chiefly at Luxor. I may say, indeed, that our life here was one long pursuit of the pleasures of the chase. The game, it is true, was prohibited ; but we enjoyed it none the less because it was illegal. Perhaps we enjoyed it the more. There were whispers about this time of a tomb that had been discovered on the western side – a wonderful tomb, rich in all kinds of treasures. No one, of course, had seen these things. No one knew who had found them. No one knew where they were hidden. But there was a solemn secrecy about certain of the Arabs, and a conscious look about some of the visitors, and an air of awakened vigilance about the government officials, which savoured of mystery. These rumours by and by assumed more definite proportions. Dark hints were dropped of a possible papyrus ; the M. B. 's babbled of mummies ; and an American dahabeeyah, lying innocently off Karnak, was reported to have a mummy on board. Now neither L. nor the Writer desired to become the happy proprietor of an ancient Egyptian ; but the papyrus was a thing to be thought of. In a fatal hour we expressed a wish to see it. From that moment every mummy-snatcher in the place regarded us as his lawful prey. Beguiled into one den after another, we were shown all the stolen goods in Thebes. Some of the things were very curious and interesting. In one house we were offered two bronze vases, each with a band of delicately-engraved hieroglyphs running round the lip ; also a square stand of basket-work in two colours, precisely like that engraved in Sir G. Wilkinson's first volume, 43 after the original in the Berlin Museum. Pieces of mummy-case and wall-sculpture and sepulchral tablets abounded ; and on one occasion we were introduced into the presence of – a mummy! All these houses were tombs, and in this one the mummy was stowed away in a kind of recess at the end of a long rock-cut passage ; probably the very place once occupied by the original tenant. It was a mummy of the same period as that which we saw disentombed under the auspices of the Governor, and was enclosed in the same kind of cartonnage, patterned in many colours on a white ground. I shall never forget that curious scene – the dark and dusty vault ; the Arabs with their lanterns ; the mummy in its gaudy cerements lying on an old mat at our feet. Meanwhile we tried in vain to get sight of the coveted papyrus. A grave Arab dropped in once or twice after nightfall, and talked it over vaguely with the dragoman ; but never came to the point. He offered it first, with a mummy, for £100. Finding, however, that we would neither buy his papyrus unseen nor his mummy at any price, he haggled and hesitated for a day or two, evidently trying to play us off against some rival or rivals unknown, and then finally disappeared. These rivals, we afterwards found, were the M. B.'s. They bought both mummy and papyrus at an enormous price ; and then, unable to endure the perfume of their ancient Egyptian, drowned the dear departed at the end of a week. Other purchasers are possibly less sensitive. We heard, at all events, of fifteen mummies successfully insinuated through the Alexandrian Custom-house by a single agent that winter. There is, in fact, a growing passion for mummies among Nile travellers. Unfortunately, the prices rise with the demand ; and although the mine is practically inexhaustible, a mummy nowadays becomes not only a prohibited, but a costly luxury. At Luxor, the British, American, and French Consuls are Arabs. The Prussian Consul is a Copt. The Austrian Consul is, or was, an American. 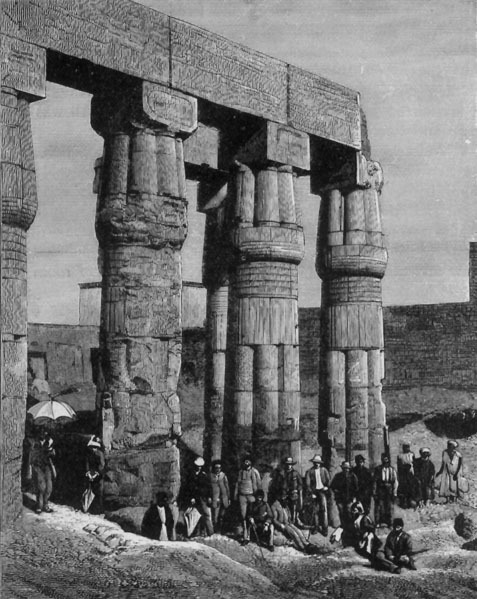 The French Consul showed us over the old tumble-down building called "The French House,"44 which, though but a rude structure of palm-timbers and sun-dried clay, built partly against and partly over the Temple of Luxor, has its place in history. COLUMNS OF AMENHOTEP III (LUXOR). For there, in 1829, Champollion and Rosellini lived and worked together, during part of their long sojourn at Thebes. Rosellini tells how they used to sit up at night, dividing the fruits of the day's labour ; Champollion copying whatever might be useful for his Egyptian grammar, and Rosellini, the new words that furnished materials for his dictionary. There, too, lodged the naval officers sent out by the French in 1831 to remove the obelisk which now stands in the Place de la Concorde. And there, writing those charming letters that delight the world Lady Duff Gordon lingered through the last few winters of her life. The rooms in which she lived first, and the balcony in which she took such pleasure, were no longer accessible, owing to the ruinous state of one of the staircases ; but we saw the rooms she last inhabited. Her couch, her rug, her folding chair were there still. The walls were furnished with a few cheap prints and a pair of tin sconces. All was very bare and comfortless. We asked if it was just like this when the Sittèh lived here. The Arab Consul replied that she had "a table, and some books." He looked himself in the last stage of consumption, and spoke and moved like one that had done with life. We were shocked at the dreariness of the place – till we went to the window. That window, which commanded the Nile and the western plain of Thebes, furnished the room and made its poverty splendid. Another historical house is that built by Sir G. Wilkinson, among the tombs of Sheykh Abd-el-Koorneh. Here he lived while amassing the materials for his Manners and Customs of the Ancient Egyptians ; and here Lepsius and his company of artists put up while at work on the western bank. Science makes little impression on the native mind. No one now remembers Champollion, or Rosellini, or Sir G. Wilkinson ; but every Arab in Luxor cherishes the memory of Lady Duff Gordon in his heart of hearts, and speaks of her with blessings. The French House was built over the roof of the sanctuary, at the southern end of the Temple. At the northern end, built up between the enormous sandstone columns of the Great Colonnade, was the house of Mustapha Aga, most hospitable and kindly of British Consuls. Mustapha Aga had travelled in Europe, and spoke fluent Italian, English, and French. His eldest son was Governor of Luxor ; his younger – the "little Ahmed" whom Lady Duff Gordon delighted to educate – having spent two years in England as the guest of Lord D., had become an accomplished Englishman. In the round of gaiety that goes on at Luxor the British Consulate played the leading part. Mustapha Aga entertained all the English dahabeeyahs, and all the English dahabeeyahs entertained Mustapha Aga. We were invited to several fantasias at the Consulate, and dined with Mustapha Aga at his suburban house the evening before we left Luxor. The appointed hour was 8.30 P.M. We arrived amid much barking of dogs, and were received by our host in a large empty hall surrounded by a divan. Here we remained till dinner was announced. We were next ushered through an anteroom where two turbaned and barefooted servants were in waiting ; the one with a brass basin and ewer, the other with an armful of Turkish towels. We then, each in turn, held our hands over the basin ; had water poured on them ; and received a towel apiece. These towels we were told to keep ; and they served for dinner-napkins. The anteroom opened into a brilliantly-lighted dining-room of moderate size, having in the centre a round brass table with an upright fluted rim, like a big tray. For each person were placed a chair, a huge block of bread, a wooden spoon, two tumblers, and a bouquet. Plates, knives, forks, there were none. The party consisted of the Happy Couple, the Director of the Luxor Telegraph Office, L., the Writer, Ahmed, and our host. "To-night we are all Arabs," said Mustapha Aga, as he showed us where to sit. "We drink Nile water, and we eat with our fingers." So we drank Nile water ; and for the first time in our lives we ate with our fingers. In fact, we found them exceedingly useful. Stewed pigeons. Spinach and rice. Kebobs 48 of mutton. Kebobs of lambs' kidneys. These dishes were placed one at a time in the middle of the table, and rapidly changed. Each dipped his own spoon in the soup, dived into the stew, and pulled off pieces of fish or lamb with his fingers. Having no plates, we made plates of our bread. Meanwhile Mustapha Aga, like an attentive host, tore off an especially choice morsel now and then, and handed it to one or other of his guests. To eat gracefully with one's fingers is a fine art ; to carve with them skilfully is a science. None of us, I think, will soon forget the wonderful way in which our host attacked and vanquished the turkey – a solid colossus weighing twenty lbs., and roasted to perfection. Half-rising, he turned back his cuff, poised his wrist, and, driving his forefinger and thumb deep into the breast, brought out a long, stringy, smoking fragment, which he deposited on the plate of the Writer. Thus begun, the turkey went round the table amid peals of laughter, and was punished by each in turn. The pilaff which followed is always the last dish served at an Egyptian or Turkish dinner. After this, our spoons were changed and the sweets were put upon the table. The drinks throughout were plain water, rice-water, and lemonade. Some native musicians played in the anteroom during dinner ; and when we rose from the table, we washed our hands as before. We now returned to the large hall, and not being accomplished in the art and mystery of sitting cross-legged, curled ourselves up on the divans as best we could. The Writer was conducted by Mustapha Aga to the corner seat at the upper end of the room, where he said the Princess of Wales had sat when their Royal Highnesses dined with him the year before. We were then served with pipes and coffee. The gentlemen smoked chibouques and cigarettes, while for us there were gorgeous rose-water narghilehs with long flexible tubes and amber mouthpieces. L. had the Princess's pipe, and smoked it very cleverly all the evening. By and by came the Governor, the Kadî of Luxor, the Prussian Consul and his son, and some three or four grave-looking merchants in rich silk robes and ample turbans. Meanwhile the band – two fiddles, a tambourine, and a darabukkeh – played at intervals at the lower end of the hall ; pipes, coffee, and lemonade went continually round ; and the entertainment wound up, as native entertainments always do wind up at Luxor, with a performance of Ghawâzi. We had already seen these dancers at two previous fantasias, and we admired them no more the third time than the first. They wore baggy Turkish trowsers, loose gowns of gaudy pattern, and a profusion of jewellery. The première danseuse was a fine woman and rather handsome ; but in the "belle" of the company, a thick-lipped Nubian, we could discover no charm whatever. The performances of the Ghawâzi – which are very ungraceful and almost wholly pantomimic – have been too often described to need description here. Only once, indeed, did we see them perform an actual dance ; and then they swam lightly to and fro, clattering their castanets, crossing and re-crossing, and bounding every now and then down the whole length of the room. This dance, we were told, was of unknown antiquity. They sang occasionally ; but their voices were harsh and their melodies inharmonious. There was present, however, one native performer whom we had already heard many times, and of whose skill we never tired. This was the leader of the little band – an old man who played the Kemengeh, 55 or cocoa-nut fiddle. A more unpromising instrument than the Kemengeh it would be difficult to conceive ; yet our old Arab contrived to make it discourse most eloquent music. His solos consisted of plaintive airs and extemporised variations, embroidered with difficult, and sometimes extravagant, cadenzas. He always began sedately, but warmed to his work as he went on ; seeming at last to forget everything but his own delight in his own music. At such times one could see that he was weaving some romance in his thoughts, and translating it into sounds. As the strings throbbed under his fingers, the whole man became inspired ; and more than once when, in shower after shower of keen despairing notes, he had described the wildest anguish of passion, I have observed his colour change and his hand tremble. Although we heard him repeatedly, and engaged him more than once when we had friends to dinner, I am sorry to say that I forget the name of this really great artist. He is, however, celebrated throughout the Thebaid, and is constantly summoned to Erment, Esneh, Keneh, Girgeh, and other large towns, to perform at private entertainments. While at Luxor, we went one Sunday morning to the Coptic church – a large building at the northern extremity of the village. Church, schools, and Bishop's house, are here grouped under one roof and enclosed in a courtyard ; for Luxor is the centre of one of the twelve sees into which Coptic Egypt is divided. The church, which has been rebuilt of late years, is constructed of sun-dried brick, having a small apse towards the east, and at the lower or western end a screened atrium for the women. The centre aisle is perhaps thirty feet in width ; the side-aisles, if aisles they can be called, being thickly planted with stone pillars supporting round arches. These pillars came from Karnak, and were the gift of the Khedive. They have lotus-bud capitals, and measure about fifteen feet high in the shaft. At the upper end of the nave, some eighteen or twenty feet in advance of the apse, there stands a very beautiful screen inlaid in the old Coptic style with cedar, ebony, rosewood, ivory, and mother-of-pearl. This screen is the pride of the church. Through the opening in the centre, one looks straight into the little waggon-roofed apse, which contains a small table and a suspended lamp, and is as dark as the sanctuary of an Egyptian temple. The reading-desk, like a rickety office stool, faces the congregation ; and just inside the screen stands the Bishop's chair. Upon this plan, which closely resembles the plan of the first cathedral of St. Peter at Rome, most Coptic churches are built. They vary chiefly in the number of apses, some having as many as five. The atrium generally contains a large tank, called the Epiphany tank, into which, in memory of the baptism of our Lord, the men plunge at their festival of El Ghitâs. Young Todroos, the son of the Prussian Consul, conducted us to the church. We went in at about eleven o'clock and witnessed the end of the service, which had then been going on since daybreak. The atrium was crowded with women and children, and the side-aisles with men of the poorer sort. A few groups of better dressed Copts were gathered near the screen listening to a black-robed deacon, who stood reading at the reading desk with a lighted taper in his left hand. A priest in a white vestment embroidered on the breast and hood with a red Maltese cross, was squatting on his heels at the entrance to the adytum. The Bishop, all in black with a black turban, sat with his back to the congregation. Every face was turned upon us when we came in. The reader paused. The white-robed priest got up. Even the Bishop looked round. Presently a couple of acolytes, each carrying two cane-bottomed chairs, came bustling down the nave ; and, unceremoniously driving away all who were standing near, placed us in a row across the middle of the church This interruption over, the reading was resumed. We now observed with some surprise that every word of the lessons as they were read in Coptic was translated, viva voce, into Arabic by a youth in a surplice, who stood against the screen facing the congregation. He had no book, but went on fluently enough, following close upon the voice of the reader. This, we were told, was done only during the reading of the lessons, the Gospel, and the Lord's Prayer. The rest of the service is performed without translation ; and, the Coptic being a dead language, is consequently unintelligible to the people. When the reading of the Gospel was over, the deacon retired. The priest then came forward and made a sign to the school children, who ran up noisily from all parts of the church, and joined with the choristers in a wild kind of chant. It seemed to us that this chant concluded the first part of the service. The second part closely resembled the celebration of mass. The priest came to the door of the screen ; looked at the congregation ; folded his hands palm to palm ; went up to the threshold of the apse, and began reciting what sounded like a litany. He then uncovered the sacred vessels, which till now had been concealed under two blue cotton handkerchiefs, and, turning, shook the handkerchiefs towards the people. He then consecrated the wine and wafer ; elevated the host ; and himself partook of the Eucharist in both elements. A little bell was rung during the consecration and again at the elevation. The people, meanwhile, stood very reverently, with their heads bent ; but no one knelt during any part of the service. After this, the officiating priest washed his hands in a brass basin ; and the deacon – who was also the schoolmaster – came round the church holding up his scarf, which was heaped full of little cakes of unleavened bread. These he distributed to all present. An acolyte followed with a plate, and collected the offerings of the congregation. We now thought the service was over ; but there remained four wee, crumpled, brown mites of babies to be christened. These small Copts were carried up the church by four acolytes, followed by four anxious fathers. The priest then muttered a short prayer ; crossed the babies with water from the basin in which he had washed his hands ; drank the water ; wiped the basin out with a piece of bread ; ate the bread ; and dismissed the little newly-made Christians with a hasty blessing. Before leaving, we asked permission to look at the books from which the service had been read. They were all very old and dilapidated. The New Testament, however, was in better condition than the rest, and was beautifully written upon vellum, in red and black ink. The Coptic, of course, looks like Greek to the eyes of the uninitiated ; but some of the illuminated capitals struck us as bearing a marked resemblance to certain of the more familiar hieroglyphic characters. While we were examining the books, the Bishop sent his servant to invite us to pay him a visit. We accordingly followed the man up an outer flight of wooden steps at one corner of the courtyard, and were shown into a large room built partly over the church. Here we found the Bishop – handsome, plump, dignified, with soft brown eyes, and a slightly grizzled beard – seated cross-legged on a divan, and smoking his chibouque. On a table in the middle of the room stood two or three blue and white bottles of Oriental porcelain. The windows, which were sashless and very large, looked over to Karnak. The sparrows flew in and out as they listed. The Bishop received us very amiably, and the proceedings opened as usual with pipes and coffee. The conversation which followed consisted chiefly of questions on our part, and of answers on his. We asked the extent of his diocese, and learned that it reached from Assûan on the south to Keneh on the north. The revenue of the see, he said, was wholly derived from endowments in land. He estimated the number of Copts in Luxor at 2000, being two-thirds of the entire population. The church was built and decorated in the time of his predecessor. He had himself been Bishop here for rather more than four years. We then spoke of the service we had just witnessed, and of the books we had seen. I showed him my prayer-book, which he examined with much curiosity. I explained the differences indicated by the black and the rubricated matter, and pointed out the parts that were sung. He was, however, more interested in the outside than in the contents, and tapped the binding once or twice, to see if it were leather or wood. As for the gilt corners and clasp, he undoubtedly took them for solid gold. The conversation next turned upon Coptic ; the Idle Man asking him if he believed it to be the tongue actually spoken by the ancient Egyptians. "Yes, undoubtedly. What else should it be?" The Idle Man hereupon suggested that it seemed to him, from what he had just seen of the church books, as if it might be a corrupt form of Byzantine Greek. This was the longest speech we heard him make, and he delivered it with some emphasis. I then asked him if the Coptic was in all respects a dead language ; to which he replied that many Coptic words, such as the names of the months and of certain festivals, were still in daily use. This, however, was not quite what I meant ; so I put the question in another form, and asked if he thought any fragments of the tongue yet survived among the peasantry. He pondered a moment before replying. "That," he said, "is a question to which it is difficult to give a precise answer, but I think you might yet find, in some of the remoter villages, an old man here and there who would understand it a little." I thought this a very interesting reply to a very interesting question. After sitting about half an hour we rose and took leave. The Bishop shook hands with us all round, and, but that we protested against it, would have accompanied us to the head of the stairs. This interview was altogether very pleasant. The Copts are said to be sullen in manner, and so bigoted that even a Moslem is less an object of dislike to them than a Christian of any other denomination. However this may be, we saw nothing of it. We experienced, on the contrary, many acts of civility from the Copts with whom we were brought into communication. No traveller in Egypt should, I think, omit being present at a service in a Coptic church. For a Coptic church is now the only place in which one may hear the last utterances of that far-off race with whose pursuits and pleasures the tomb-paintings make us so familiar. We know that great changes have come over the language since it was spoken by Rameses the Great and written by Pentaur. We know that the Coptic of to-day bears to the Egyptian of the Pharaohs some such resemblance, perhaps, as the English of Macaulay bears to the English of Chaucer. Yet it is at bottom the tongue of old Egypt, and it is something to hear the last lingering echoes of that ancient speech read by the undoubted descendants of the Egyptian people. In another fifty years or so, the Coptic will in all probability be superseded by the Arabic in the services of this Church ; and then the very tradition of its pronunciation will be lost. The Copts themselves, it is said, are fast going over to the dominant faith. Perhaps by the time our own descendants are counting the two thousandth anniversary of the Christian era, both Copts and Coptic will be extinct in Egypt. A day or two after this we dropped down to Karnak, where we remained till the end of the week, and on the following Sunday we resumed our downward voyage. If the universe of literature was unconditioned, and the present book was independent of time and space, I would write another chapter here about Karnak. But Karnak, to be fairly dealt by, would ask, not a chapter, but a volume. So, having already told something of the impression first made upon us by that wilderness of wonders, I will say no more. 1 This was, no doubt, an interment of the period of the XXIIIrd or XXIVth Dynasty, the style of which is thus described by Mariette : "Succèdent les caisses à fond blanc. Autour de celles-çi court une légende en hiéroglyphes de toutes couleurs. Le devant du couvercle est divisé horizontalement en tableaux où alternent les représentations et les textes tracés en hiéroglyphes verdâtres. La momie elle-même est hermétiquement enfermée dans un cartonnage cousu par derrière et peint de couleurs tranchantes." – Notice des Monuments à Boulak, p. 46. Paris, 1872. 2 Diodorus, Biblioth. Hist., Bk. i. chap. iv. The fault of inaccuracy ought, however, to be charged to Hecatæus, who was the authority followed here by Diodorus. 3 Possibly the Smendes of Manetho, and the Ba-en-Ded whose cartouche is found by Brugsch on a sarcophagus in the museum at Vienna ; see Hist. d'Egypt, chap. x. p. 213, ed. 1859. Another claimant to this identification is found in a King named Se-Mentu, whose cartouches were found by Mariette on some small gold tablets at Tanis. 4 Letter XIV. p. 235, Letters d'Egypte ; Paris, 1868. See also chapter xviii. of the present work ; p. 349. 5 See Champollion, Letter XIV, footnote, p. 418. 7 The Syenite colossus of which the British Museum possesses the head, and which is popularly known as the Young Memnon, measured twenty-four feet in height before it was broken up by the French. 8 See woodcut No. 340 in Sir G. Wilkinson's Manners and Customs of the Ancient Egyptians, vol. i. ed. 1871. 9 Among these are Abot or abode ; meaning the abode of Amen ; Ta-Uaboo, the mound ; Ta-Api, the head or capital, etc. etc. See Recherches sur le nom Egyptien de Thèbes. CHABAS : 1863 ; Textes Géographiques d'Edfoo, J. DE ROUGÉ : Révue Arch. Nouvelle Série, vol. xii. 1865 ; etc. etc. 10 The Great Harris Papyrus is described by Dr. Birch as "one of the finest, best written, and best preserved, that have been discovered in Egypt. It measures 133 feet long by 16 3/4 inches broad, and was found with several others in a tomb behind Medinet Habu. Purchased soon after by the late A C. Harris of Alexandria, it was subsequently unrolled and divided into seventy-nine leaves, and laid down on card-board. With the exception of some small portions which are wanting in the first leaf, the text is complete throughout." The papyrus purports to be a post-mortem address of the King, Rameses III, recounting the benefits he had conferred upon Egypt by his administration, and by his delivery of the country from foreign subjection. It also records the immense gifts which he had conferred on the Temples of Egypt, of Amen at Thebes, Tum at Heliopolis and Ptah at Memphis. etc. "The last part is addressed to the officers of the army, consisting partly of Sardinian and Libyan mercenaries, and to the people of Egypt, in the thirty-second year of his reign, and is a kind of posthumous panegyrical discourse, or political will, like that of Augustus discovered at Ancyra. The papyrus itself consists of the following divisions, three of which are preceded by large coloured plates or vignettes: – Introduction: donations to the Theban deities ; donations to the gods of Heliopolis ; donations to the gods of Memphis ; donations to the gods of the north and south: summary of donations ; historical speech and conclusion. Throughout the monarch speaks in the first person, the list excepted." Introduction to Annals of Rameses III ; S. BIRCH : Records of the Past, vol. vi. p. 21 ; 1876. 11 "Rameses III was one of the most remarkable monarchs in the annals of Egypt. A period of political confusion and foreign conquest of the country preceded his advent to the throne. His father, Setnecht, had indeed succeeded in driving out the foreign invaders, and re-establishing the native dynasty of the Theban kings, the twentieth of the list of Manetho. But Rameses had a great task before him, called to the throne at a youthful age. . . . The first task of Rameses was to restore the civil government and military discipline. In his fifth year, he defeated the Maxyes and Libyans with great slaughter when they invaded Egypt, led by five chiefs ; and in the same year he had also to repulse the Satu, or eastern foreigners, who had attacked Egypt. The maritime nations of the west, it appears, had invaded Palestine and the Syrian coast in his eighth year, and after taking Carchemish, a confederation of the Pulusata, supposed by some to be the Pelasgi, Tekkaru or Teucri, Sakalus̃a or Siculi, Tanau or Daunians, if not Danai, and Uas̃as̃a or Osci, marched to the conquest of Egypt. It is possible that they reached the mouth of the eastern branch of the Nile. But Rameses concentrated an army at Taha, in Northern Palestine, and marched back to defend the Nile. Assisted by his mercenary forces, he inflicted a severe defeat on the confederated west, and returned with his prisoners to Thebes. In his eleventh year the Mashuasha or Maxyes, assisted by the Tahennu or Libyans, again invaded Egypt, to suffer a fresh defeat, and the country seems from this period to have remained in a state of tranquillity.... The vast Temple at Medinet Habu, his palaces and treasury, still remain to attest his magnificence and grandeur ; and if his domestic life was that of an ordinary Egyptian monarch, he was as distinguished in the battlefield as the palace. Treason, no doubt, disturbed his latter days, and it is not known how he died ; but he expired after a reign of thirty-one years and some months, and left the throne to his son, it is supposed, about B.C. 1200." See Remarks upon the Cover of the Granite Sarcophagus of Rameses III: S. BIRCH, LL.D., Cambridge, 1876. 12 "There is reason to believe that this is only a fragment of the building, and foundations exist which render it probable that the whole was originally a square of the width of the front, and had other chambers, probably in wood or brick, besides those we now find. This would hardly detract from the playful character of the design, and when coloured, as it originally was, and with its battlements or ornaments complete, it must have formed a composition as pleasing as it is unlike our usual conceptions of Egyptian art." Hist. of Architecture, by J. FERGUSSON, Bk. i., ch. iv., p. 118, Lond. 1865. 13 Medinet Habu continued up to the period of the Arab invasion to be inhabited by the Coptic descendants of its ancient builders. They fled, however, before Amr and his army, since which time the place has been deserted. 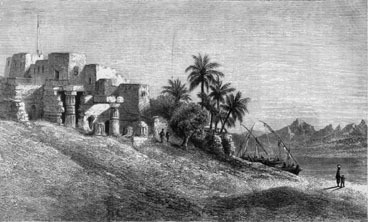 It is not known whether the siege took place at the time of the Arab invasion, or during the raid of Cambyses, but whenever it was, the place was evidently forced by the besiegers. The author of Murray's Handbook draws attention to the fact that the granite jambs of the doorway leading to the smaller Temple are cut through exactly at the place where the bar was placed across the door. 14 Herodotus, Bk. ii. chap. 122. 15 "A Medinet Habou, dans son palais, il s'est fait représenter jouant aux dames avec des femmes qui, d'après certaines copies, semblent porter sur la tête les fleurs symboliques de l'Egypte supérieure et inférieure, comme les deésses du monde supérieur et inférieur, ou du ciel et de la terre. Cette dualité des deésses, qui est indiquée dans les scènes religieuses et les textes sacrés par la réunion de Satis et Anoucis, Pasht et Bast, Isis et Nephthys, etc., me fait penser que les tableaux de Medinet Habou peuvent avoir été considérés dans les légendes populaires comme offrant aux yeux l'allégorie de la scène du jeu de dames entre le roi et la deésse Isis, dont Hérodote a fait la Déméter egyptienne, comme il a fait d'Osiris le Dionysus du même peuple." – Le Roi Rhampsinite et le Jeu des Dames, par S. BIRCH. Revue Arch: Nouvelle Série, vol. xii., p. 58. Paris: 1865. 16 BAAL, written sometimes Bar, was, like Sutekh, a God borrowed from the Phœnician mythology. The worship of Baal seems to have been introduced into Egypt during the XIXth Dynasty. The other God here mentioned, Mentu or Month, was a solar deity adored in the Thebaid, and especially worshipped at Hermonthis, now Erment ; a modern town of some importance, the name of which is still almost identical with the Per-Mentu of ancient days. Mentu was the Egyptian, and Baal the Phœnician, god of war. 17 From one of the inscriptions at Medinet Habu, quoted by Chabas. See Antiquité Historique, ch. iv. p. 238. Ed. 1873. 18 It is a noteworthy fact (and one which has not, so far as I know, been previously noticed) that while the Asiatic and African chiefs represented in these friezes are insolently described in the accompanying hieroglyphic inscriptions as "the vile Libyan," "the vile Kushite," "the vile Mashuasha," and so forth, the European leaders, though likewise prostrate and bound, are more respectfully designated as "the Great of Sardinia," "the Great of Sicily," "the Great of Etruria," etc. etc. May this be taken as an indication that their strength as military powers was already more formidable than that of the Egyptians' nearer neighbours? 19 The grand blue of the ceiling of the colonnade of the Great Hypæthral Court is also very remarkable for brilliancy and purity of tone ; while to those interested in decoration the capital and abacus of the second column to the right on entering this courtyard, offers an interesting specimen of polychrome ornamentation on a gold-coloured ground. 20Inscriptions at Medinet Habu. See Chabas' Antiquité Historique, chap. iv. Paris: 1876. 21The whole of this chronicle is translated by M. Chabas in L'Antiquité Historique, chap. iv. p. 246 et seq. It is also engraved in full in Rosellini (Monumenti Storici) ; and has been admirably photographed by both M. Hammerschmidt and Signor Beata. 22 These two statues – the best-known, probably, of all Egyptian monuments – have been too often described, painted, engraved, and photographed, to need more than a passing reference. Their featureless faces, their attitude, their surroundings, are familiar as the Pyramids, even to those who know not Egypt. We all know that they represent Amenhotep, or Amunoph, III ; and that the northernmost was shattered to the waist by the earthquake of B.C. 27. Being heard to give out a musical sound during the first hour of the day, the statue was supposed by the ancients to be endowed with a miraculous voice. The Greeks, believing it to represent the fabled son of Tithonus and Aurora, gave it the name of Memnon ; notwithstanding that the Egyptians themselves claimed the statues as portraits of Amenhotep III. Prefects, Consuls, Emperors, and Empresses, came "to hear Memnon," as the phrase then ran. Among the famous visitors who travelled thither on this errand, we find Strabo, Germanicus, Hadrian, and the Empress Sabina. Opinion is divided as to the cause of this sound. There is undoubtedly a hollow space inside the throne of this statue, as may be seen by all who examine it from behind ; and Sir G. Wilkinson, in expressing his conviction that the musical sound was a piece of priestly jugglery, represents the opinion of the majority. The author of a carefully considered article in the Quarterly Review, No. 276, April 1875, coincides with Sir D. Brewster in attributing the sound to a transmission of rarefied air through the crevices of the stone, caused by the sudden change of temperature consequent on the rising of the sun. The statue, which, like its companion, was originally one solid monolith of grit-stone, was repaired with sandstone during the reign of Septimius Severus. 23This deification of the dead was not deification in the Roman sense ; neither was it canonisation in the modern sense. The Egyptians believed the justified dead to be assimilated, or rather identified, in the spirit with Osiris, the beneficent Judge and Deity of the lower world. Thus, in their worship of ancestry, they adored not mortals immortalised, but the dead in Osiris, and Osiris in the dead. It is worth noting, by the way, that notwithstanding the subsequent deification of Seti I, Rameses I remained, so to say, the tutelary saint of the Temple. He alone is represented with the curious pointed and upturned beard, like a chamois horn reversed, which is the peculiar attribute of deity. 24There is among the funereal tablets of the Boulak collection a small bas-relief sculpture representing the arrival of a family of mourners at the tomb of a deceased ancestor. The statue of the defunct sits at the upper end. The mourners are laden with offerings. One little child carries a lamb, another a goose. A scribe stands by, waiting to register the gifts. The tablet commemorates one Psamtik-nefar-Sam, a hierogrammate under some king of the XXVIth Dynasty. The natural grace and simple pathos with which this little frieze is treated lift it far above the level of ordinary Egyptian art, and bear comparison with the class of monuments lately discovered on the Eleusinian road at Athens. 25"Une dignité tout à fait particulier est celle que les inscriptions hiéroglyphiques désignent par le titre 'prophète de la pyramide, de tel pharaon.' II parait qu'après sa mort chaque roi était vénéré par un culte spécial." Histoire d'Egypte: BRUGSCH, 2d ed. chap. v. p. 35. Leipzig: 1875. 26There is a very curious window at the end of this sanctuary, with grooves for the shutter, and holes in which to slip and drop the bar by which it was fastened. 27The Gate of the King. 28These funerary statues are represented each on a stand or platform, erect, with one foot advanced, as if walking, the right hand holding the ankh, or symbol of life, the left hand grasping a staff. The attitude is that of the wooden statue at Boulak ; and it is worth remark that the figures stand detached, with no support at the back, which was never the case with those carved in stone or granite. There can be no doubt that this curious series of funerary statues represents those which were actually placed in the tomb ; and that the ceremonies here represented were actually peformed before them, previous to closing the mouth of the sepulchre. One of these very wooden statues, from this very tomb, was brought to England by Belzoni, and is now in the British Museum (No. 854, Central Saloon). The wood is much decayed, and the statue ought undoubtedly to be placed under glass. The tableaux representing the above ceremonies are well copied in Rosellini, Mon. del Culto, plates 60-63. 29A remarkable inscription in this tomb, relating the wrath of Ra and the destruction of mankind, is translated by M. Naville, vol. iv. Pt. i. Translations of the Biblical Arch. Society. In this singular myth, which bears a family resemblance to the Chaldæan record of the Flood, the deluge is a deluge of human blood. The inscription covers the walls of a small chamber known as the Chamber of the Cow. 30The longest tomb in the valley, which is that of Seti I, measures 470 feet in length to the point where it is closed by the falling in of the rock ; and the total depth of its descent is about 180 feet. The tomb of Rameses III (No. II) measures in length 405 feet, and descends only 31 feet. The rest average from about 350 to 150 feet in length, and the shortest is excavated to a distance of only 65 feet. We visited, however, one tomb in the Assaseef, which in extent far exceeds any of the tombs of the kings. This astonishing excavation, which consists of a bewildering labyrinth of halls, passages, staircases, pits, and chambers, is calculated at 23,809 square feet. The name of the occupant was Petamunap, a priest of uncertain date. 31Apophis, in Egyptian Apap ; the great serpent of darkness, over whom Ra must triumph after he sets in the west, and before he again rises in the east. 32Kheper, the scarab deity. See chap. vi. p. 96. 34The crocodile represents Sebek. In one of the Boulak papyri, this God is called the son of Isis, and combats the enemies of Osiris. Here he combats Apophis in behalf of Ra. 35The tomb numbered 3 in the first small ravine to the left as one rides up the valley, bears the cartouches of Rameses II. The Writer crawled in as far as the choked condition of the tomb permitted, but the passage becomes quite impassable after the first thirty or forty yards. 36When first seen by Sir G. Wilkinson, these harpers were still in such good preservation, that he reported of one at least, if not both, as obviously blind. The harps are magnificent, richly inlaid and gilded, and adorned with busts of the king. One has eleven strings, the other fourteen. 37The sarcophagus of Seti I, which was brought to England by Belzoni, is in Sir J. Soane's Museum. It is carved from a single block of the finest alabaster, and is covered with incised hieroglyphic texts and several hundred figures, descriptive of the passage of the sun through the hours of the night. See Le Sarcophage de Seti I. P. PIERRET. Revue Arch. vol. xxi. p. 285: 1870. The sarcophagus of Rameses III is in the Fitz-William Museum, Cambridge, and the lid thereof is in the Egyptian collection of the Louvre. See Remarks on the Sarcophagus of Rameses III. S. BIRCH, LL.D. ; Cambridge, 1876. Also Notice Sommaire des Monuments Egyptiens du Louvre. E. DE ROUGÉ, p. 51: Paris, 1873. 38Abbot Papyrus, British Museum. This papyrus, which has been translated by M. Chabas (Mélanges Egyptologiques, 3d Serie: Paris and Chalon, 1870), gives a list of royal tombs inspected by an Egyptian Commission in the month of Athyr (year unknown), during the reign of Rameses IX. Among the tombs visited on this occasion mention is especially made of "the funeral monument of the king En-Aa, which is at the north of the Amenophium of the terrace. The monument is broken into from the back, at the place where the stela is placed before the monument, and having the statue of the king upon the front of the stela, with his hound, named Bahuka, between his legs. Verified this day, and found intact." Such was the report of the writer of this papyrus of 3000 years ago. And now comes one of the wonders of modern discovery. It was but a few years ago that Mariette, excavating in that part of the Necropolis called the Assaseef, which lies to the north of the ruins of the Amenophium, discovered the remains of the tomb of this very king, and the broken stela bearing upon its face a full-length bas-relief of King En-Aa (or Entef-Aa), with three dogs before him and one between his legs; the dog Bahuka having his name engraved over his back in hieroglyphic characters – See Tablet of Antefaa II. S. BIRCH, LL.D. Transactions of the Biblical Arch. Society, vol. iv. part i. p. 172. 40There is in one of the Papyri of the Louvre a very curious illustration, representing – 1st, the funeral procession of one Neb-Set, deceased ; 2nd, the interior of the sepulchre, with the mummy, the offerings, and the furniture of the tomb, elaborately drawn and coloured. Among the objects here shown are two torches, three vases, a coffer, a mirror, a Kohl bottle, a pair of sandals, a staff, a vase for ointment, a perfume bottle, and an ablution jar. "These objects, all belonging to the toilette (for the coffer would have contained clothing), were placed in the tomb for that day of waking which the popular belief promised to the dead. The tomb was therefore furnished like the abodes of the living." – Translated from T. DEVÉRIA, Catalogue des Manuscrits Egyptiens du Louvre : Paris, 1875, p. 80. The plan of the sepulchre of Neb-Set is also drawn upon this papyrus ; and the soul of the deceased, represented as a human-headed bird, is shown flying down towards the mummy. A fine sarcophagus in the Boulak museum (No. 84) is decorated in like manner with a representation of the mummy on its bier being visited, or finally rejoined, by the soul. I have also in my own collection a funeral papyrus vignetted on one side with this same subject ; and bearing on the reverse side an architectural elevation of the monument erected over the sepulchre of the deceased. 41"King Rhampsinitus (Rameses III) was possessed, they said, of great riches in silver, indeed, to such an amount that none of the princes, his successors, surpassed or even equalled his wealth." – HERODOTUS, Book ii. chap. 121. 42Impossible from the Egyptian point of view. "That the body should not waste or decay was an object of anxious solicitude ; and for this purpose various bandlets and amulets, prepared with certain magical preparations, and sanctified with certain spells or prayers, or even offerings and small sacrifices, were distributed over various parts of the mummy. In some mysterious manner the immortality of the body was deemed as important as the passage of the soul ; and at a later period the growth or natural reparation of the body was invoked as earnestly as the life or passage of the soul to the upper regions." – See Introduction to the Funereal Ritual, S. BIRCH, LL.D., in vol. v. of BUNSEN'S Egypt : Lond. 1867. 43The Ancient Egyptians, Sir G. Wilkinson ; vol. i. chap. ii. woodcut No. 92. Lond. 1871. 46Samak: a large flat fish, rather like a brill. 47Dall: roast shoulder of lamb. 48Kebobs: small lumps of meat grilled on skewers. 50Pilaff: boiled rice, mixed with a little butter, and seasoned with salt and pepper. 52Kunáfah: a rich pudding made of rice, almonds, cream, cinnamon, etc. etc. 54Totleh: sweet jelly, encrusted with blanched almonds. 55The kemengeh is a kind of small two-stringed fiddle, the body of which is made of half a cocoa-nut shell. It has a very long neck, and a long foot that rests upon the ground, like the foot of a violoncello ; and it is played with a bow about a yard in length The strings are of twisted horsehair. 56"The Copts are Christians of the sect called Jacobites, Eutychians, Monophysites, and Monothelites, whose creed was condemned by the Council of Chalcedon in the reign of the Emperor Marcian. They received the appellation of 'Jacobites,' by which they are generally known, from Jacobus Baradæus, a Syrian, who was a chief propagator of the Eutychian doctrines. . . . The religious orders of the Coptic Church consist of a patriarch, a metropolitan of the Abyssinians, bishops, arch-priests, priests, deacons, and monks. In Abyssinia, Jacobite Christianity is still the prevailing religion." 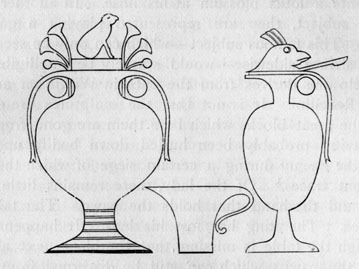 See The Modern Egyptians; by E. W. LANE. Supplement 1, p. 531. London: 1860. 57The Bishop was for the most part right. The Coptic is the ancient Egyptian language (that is to say, it is late and somewhat corrupt Egyptian) written in Greek characters instead of in hieroglyphs. For the abolition of the ancient writing was, next to the abolition of the images of the Gods, one of the first great objects of the early Church in Egypt. Unable to uproot and destroy the language of a great nation, the Christian Fathers took care so to reclothe it that every trace of the old symbolism should disappear and be forgotten. Already, in the time of Clement of Alexandria (A.D. 211), the hieroglyphic style had become obsolete. The secret of reading hieroglyphs, however, was not lost till the time of the fall of the Eastern Empire. How the lost key was recovered by Champollion is told in a quotation from Mariette Bey, in the footnote to p. 211, chapter xii. of this book. Of the relation of Coptic to Egyptian, Champollion says: "La langue égyptienne antique ne différait en rien de la langue appelée vulgairement Copte ou Cophte. . . . Les mots égyptiens écrits en caractères hieroglyphiques sur les monuments les plus anciens de Thèbes, et en caractères Grecs dans les livres Coptes, ne différent en général que par l'absence de certaines voyelles médiales omises, selon la méthode orientale, dans l'orthographe primitive." – Grammaire Egyptienne, p. 18. The Bishop, though perfectly right in stating that Coptic and Egyptian were one, and that the Coptic was a distinct language having no affinity with the Greek, was, however, entirely wrong in that part of his explanation which related to the alphabet. So far from eight Greek letters having been added to the Coptic alphabet upon the introduction of Christianity into Egypt, there was no such thing as a Coptic alphabet previous to that time. The Coptic alphabet is the Greek alphabet as imposed upon Egypt by the Fathers of the early Greek Church ; and that alphabet being found insufficient to convey all the sounds of the Egyptian tongue, eight new characters were borrowed from the demotic to supplement the deficiency.